A. Dental implants are a wonderful way to replace missing teeth when certain conditions exist. Such things as your overall general health and the length of time you have been missing your teeth must be considered. The replacement of missing teeth using dental implants may occasionally involve a team approach. After a thorough examination and treatment plan the surgical phase of treatment takes place, in which the implants are placed into the jaw. When healing is complete, usually after 4-6 months, the tooth or bridge segment can be placed on top of the healed implants. B. Bridges. When you are missing teeth, and you have healthy teeth on EITHER side of the missing teeth, we are often able to fabricate a permanent bridge. A bridge is simply a series on crowns (CAPS), which are precision made to fit the strong teeth on either side of the gap, and have “fake” crowns in the middle. It is permanently seated on the real teeth, and appears to the eye as individual, natural teeth. C. Dentures… are removable. They usually replace numerous teeth, and could replace all the teeth in one arch. If some natural teeth remain, dentures can be made to “grab onto” healthy teeth in order to gain some support and retention. The downside of dentures is that they must come out for at least 4 – 6 hours a day. They may also involve a long and, somewhat, painful adaptation period in which the gums get used to the pressure caused by them. The upside of dentures are that they are financially more reasonable than implant and bridges. 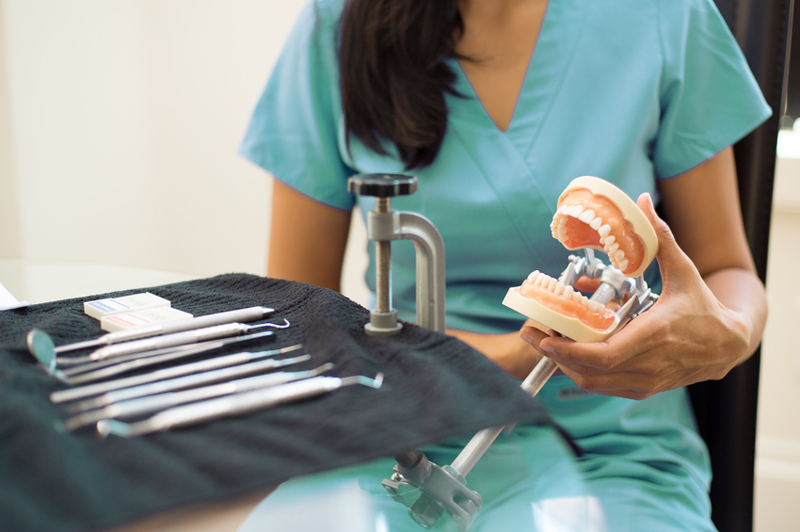 By the way, if you are missing all your teeth, several implants could be placed in your jaw to help retain the full denture and prevent it from being loose.